Gotos caters to the diverse needs of its customers with its high precision machining technology. Our solution-based efforts support the cutting edge technology of a wide range of industries such as electronics and communications, light electrical and business equipment, as well as the automotive industry. Committed to originality, we will continually pursue advanced technology, while seeking to expand the technological field. 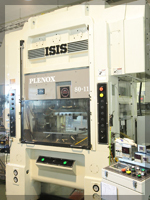 Die Manufacturing Facilities …CAD/CAM NC grinding machine, surface grinder, NC jig grinding machine etc. Surface Treatment Facilities …Thermal treatment facilities, Plating facilities, Tumbling facilities etc. Inspection Facilities …Various measuring instruments, Microscope, etc.